Whether you’re creating eye-popping mantle displays, gorgeous wreaths or topiary trees, natural crafts make holiday decorating more fun. A holiday glow begins from the time you start planning your designs and gathering materials. Make this holiday season special by creating your own natural craft ornaments for your Christmas tree, and family members of all ages can get involved. Your tree will be unique because of the materials you work with and the personal touches you add. You may even decide to grow certain plants next year specifically for crafting tree ornaments. If you want nature inside for the holidays, it’s best to begin collecting early. For the best decorations, keep your eyes open year-round for items from wooded areas, meadows or right in your own yard and garden. A large Christmas tree seems to devour small ornaments, so this is a perfect way to use up old or faded natural materials that still have some structure. You can spray paint them silver or gold to give them a warm holiday glow. Here are some fun and unique ways to bring the outdoors inside for the holidays. Pinecones are about the easiest to collect, especially in late fall. All you need to do is fasten a small hook or paper clip into the back of the cone, tie a small bow onto the hook and hang on the tree. You can also create shimmery pinecones by spray painting them silver or gold, or adding glitter or fake snow. Cluster different cones together for variety, along with fresh evergreen branches. Seedpods can create some beautiful decorations, and there’s no limit to where you can find these. Seedpods of black-eyed susan, wild beebalm, Chinese lantern, prairie bushclover, Siberian iris, Penstemon, poppies, love-in-the-mist and milkweed are just a few examples. Acorns: Gather different sizes and cluster them together, hold with glue (you may want to spray them with a gloss sealant), add your bow and hang. Or consider stringing them along with black walnuts or other nuts you’ve collected. Different varieties of nuts in the shell can be grouped and glued together and hung with a bow, or spray painted gold to add some sparkle. Use dried flowers to create small bouquets or little nose gays. Create small bundles of dried materials, secure with floral tape or tie with raffia. Use silver king Artemisia, white statice, sweet annie, feathery dried grasses or goldenrod as backing or filler material. 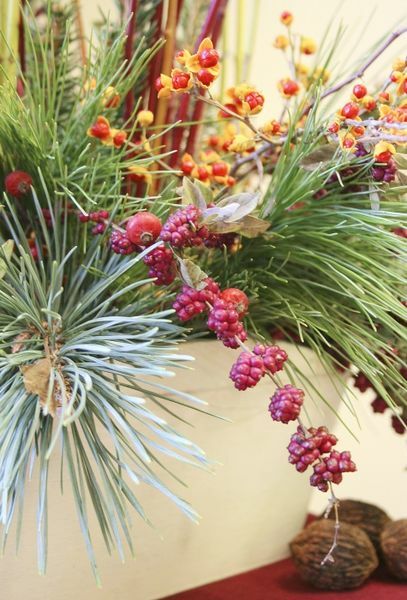 Dried rose buds, strawflowers, gomphrena and others can be included for a splash of color. Or glue dried flowers on small plastic foam balls to create colorful ornaments. Osage orange or hedge apples, gathered in the fall, can be transformed into ornaments with their decorative seed patterns. Cut the large fruit into 1/2 inch thick slices, allow to dry in the oven and spray paint both sides gold. After they dry, simply insert ornament hangers and hang on the tree. Whole osage oranges, tucked into a wire egg basket, add an old-fashioned feel to the home. Holly, bayberry, coralberry or rose hips are always a nice addition, especially if there are a lot of red berries on your sprig. A bow on the stem can be used as your hanger. Dried fruit is a real attraction on the tree, like homemade stained glass windows. Use slices of orange, apple, pear, lemon and grapefruit. Slice your fruit 1/8 inch thick, dip in a solution of one part lemon concentrate and one part water, making sure the fruit is well-covered. Line several cookie sheets with brown paper bags and heat at 175 degrees for two hours, then turn fruit over and leave in oven another 1-1/2 hours. Pomanders are wonderfully fragrant, natural room fresheners. Oranges, kumquats, limes and lemons covered with clove studs and rolled in cinnamon and orris root or left in a bowl overflowing with spices, including bay leaves and lavender, is a definite attention getter. In the autumn, it’s not hard to find little strawberry ears of corn that can be hung in clusters on the tree with a cup hook in the back and a bow to brighten them up. You can spray paint dried okra seedpods and small gourds to complete the harvest scene. If you have access to bark from a white birch tree, lay the bark flat on a table, use a cookie cutter and trace the shape, cut out and put a small hole in the ornament, tie a bow and hang on tree. The salmon-colored bark of river birch can also be peeled off and glued onto the sides of a tiny birdhouse made of cardboard. Why not gather several empty bird nests and rest them on branches to finish the natural look? You may even want to add small eggs to the nest, dyed to highlight the color theme of your tree. There are many natural beauties out there for your natural Christmas tree; and there won’t be another Christmas tree like it in the whole world!